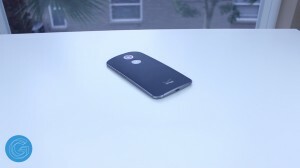 The 2nd Generation Moto X is the successor to the incredibly popular 2013 Moto X. This new generation comes with a higher res display, larger battery life, and new premium design. The iPhone 6 is Apple’s response to the ever increasing sizes of smartphones as it’s now offered in a larger 4.7 inch form factor with an even slimmer aluminum build, but is it enough? 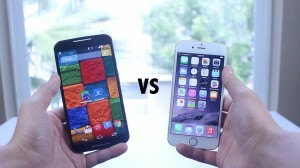 How does Apple’s new iPhone 6 stack up to the new 2014 Moto X? Be sure to give this video a thumbs up if you enjoy and let’s get started. Physically, Motorola has killed it on the design of the X. It looks great feels good in the hand and is a much more polished device than the previous gen. It has nice aluminum rings going around the edges with a soft grippy matte finish on the back. The aluminum ring reminds me very much of the HTC One (M8) but the rubbery back counteracts the slipperiness which means a case isn’t necessary with this phone. Apple on the other hand has kept the metal backing but this year it has smooth curves going around the edges which makes it much slicker than last years iPhone 5S. Aesthetically speaking I truly hate the antenna design. Apple has outlined the top and bottom of the back of the device with these ugly looking antennas and along with that there’s also the protruding camera which just doesn’t blend well with the device. For that reason I’ve pretty much had to use a case on it. I’ll have some of my favorites linked in the description if you’re interested. The Second Generation Moto X will cost you $99 for the 16GB variant on all four major US carriers except for Sprint while the iPhone 6 will run you $199 for the base 16GB model that comes with a two year contract. However, purchasing it unlocked will run you an upwards of $700 for the iPhone and $499 for the X. Neither of these smartphones have removable batteries or have expandable storage so keep that in mind before you buy the base models of either devices. You can buy the iPhone in space grey, silver, and gold variants while the Moto X can be customized on Motorola’s Moto Maker. It allows you to customize everything from the backplate, to the front plate, and trim color. I have the standard black one here, but feel free to tweet me @gadgetguruhd with your favorite customizations and I’ll retweet them. The iPhone 6 really does suffer from terrible speaker quality. They’re located directly next to the charging port which means it’s covered whenever you’re playing a game or watching a video. The speakers on the Moto X on the other hand are great. They’re located towards the front of the device and are nice and loud and surprisingly clear too. While not on the level of the HTC One (M8) with its boom sound speakers, they’re certainly better than those on the Nexus 5. The Moto X’ (2nd Gen)‘s display has now been bumped up to 5.2 inches and now has full 1920×1080 resolution. At over 424 pixels per inch you’ll need to have super vision to see any pixels. 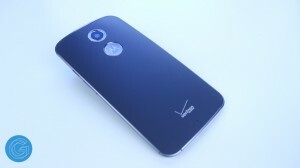 What’s great with the Moto X though is the display is Amoled so there’s tons of contrast and the screen is ultra sharp. 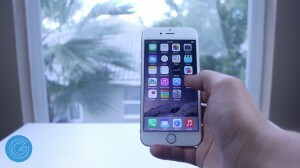 The iPhone 6’s display has also been increased up to 4.7 inches and now has 750p resolution. Now those of you that haven’t ever used or seen the iPhone 6 in person are going to say how bad the picture quality is, but it’s actually really good. 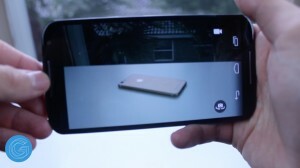 It’s every bit as clear as the Nexus 5’s or even the Galaxy S5’s display. I’m not sure what it is about Apple, but they always seem to get the display right. When it comes to the Second Generation Moto X, it also runs the latest version of Android and unlike most other manufacturers Motorola has been really good with keeping its devices always on the latest operating system. It may take a couple more months to get them than something like the Nexus, but that shouldn’t be a reason to avoid this device. As far as the exclusive features go on this device, one of my favorites is active notifications. It essentially shows notifications on the screen whenever you lift up the phone. Unlike most of the features that are on the Galaxy S5 and other Android devices, this is something I use everyday. Instead of having to unlock the device every time you go to check for notifications you simply take a quick glance at it. It’s a killer feature that really is impossible to go without once you’ve used it. As far as the fluidity and smoothness of the OS, the Moto X has certainly lived up to the hype. It really is great. Now moving onto the iPhone 6, it runs the latest version of iOS, iOS 8. One great thing about Apple is that because their operating system is more locked down you’ll be guaranteed updates for at least the next several years which is something that isn’t guaranteed with the M8. As far as the new features on iOS 8 go there’s now widgets in the notification bar, the ability to quickly respond to message in apps, Apple Pay allows you to now make payments directly from your iPhone 6, and there’s also now talk to type technology. All of these are great additions to the iOS operating system but if you’re currently on Android you probably know these features have been around for a while. That being said, the iPhone 6 is very quick and fluid, if you do decide to purchase the iPhone 6 you won’t be disappointed with the software experience. However one awesome feature that’s exclusive to the iPhone 6 is touch id. It allows you to unlock your phone with your fingerprint and also make payments with applications like Paypal and purchase items through the App store without using your password. The battery life on the 2nd Gen Moto X is stellar. I’ll go from about 6am in the morning to 10pm in the evening and have about 15-20% of battery life left with a couple hours of on screen time. The best thing honestly is the standby time, virtually no battery life is lost if the device if left locked overnight. The iPhone 6 on the other hand boasts a miniscule 1810 mAh battery that will last you through a full day. I’ve been putting it on the charger every night with about 10-15% left which isn’t as good as the M8 or Moto X, but it should be good enough. The final thing we’re going to cover is the camera performance. The iPhone 6 has an 8 megapixel camera, but don’t let the 8 megapixels fool you though because it’s without a doubt the best shooter on the market in my opinion. This years Moto X (2nd Gen) is worlds ahead of the previous gen as this new one touts 13MP Sony sensor coupled with a slightly faster f.2.2 lens. This is actually the same sensor found on devices like the LG G3 or Samsung Galaxy Note 4 which means the camera is certainly great. 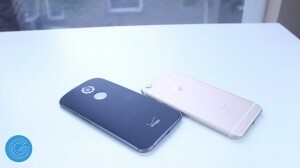 Wrapping things up here, the Moto X and iPhone 6 are both great devices. One is less expensive, with a higher res display, great build quality, and stellar battery life; while, the other offers a higher price tag, nice display, and better camera. Ultimately, you’ll have to figure out what’s most important to you in a phone, and which device better fits that profile. 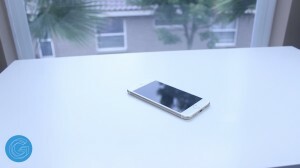 If you’re still not sure which device is best for you be sure to check out my comparisons which include the HTC One (M8), Nexus 5, and 2nd Generation Moto G.
Amazing review, completely unbiased and very well informed. I’m very inclined to get the Moto X now that my contract’s finally done, I’ll be leaving my Blackberry Z10 for this.